Why not make use of technology to help those who need it? That was the thinking of Hans Jørgen Wiberg, the founder of Be My Eyes. This gave rise to a really innovative project: to connect people with volunteers who wish to use their eyes to help another network of people who require that help, both for the small things in everyday life like knowing what’s in a can; or other larger ones, such as knowing if your child has a rash on his face because he won’t stop crying. The help is provided permanently, at any time of the day or night and throughout the world. When the project was born, and was in its early stages, the volunteer was given a set of bonus points to encourage people to register and therefore strengthen the community. However, after a short time this proved not to be necessary, as the community kept growing exponentially. The development team of Be My Eyes highlight a particular story that demonstrates the app’s usefulness. They received a call from a visually-impaired couple who asked them to identify the reading on a device they had used for a pregnancy test. The team was able to tell them that the message read: pregnancy confirmed. That’s real life! Be My Eyes attends to a total of 87,581 blind people through its over 1,515,629 volunteers all over the world, simply by making a video call. Could anything be so simple? It is important to highlight the support team and the infrastructure behind the app that make it really easy. To understand both the concept of how the service is organised internally and how it is provided to the final user, we will explain the workings of the two profiles: the volunteers and those requesting assistance. Firstly, we download the app from the SILVER Project. When it opens, the home screen displays the Privacy Policies and Conditions of Service. These are very strict. For example, jokey conversations or the forming of relationships are prohibited. On the next screen, we will see two screens: “I am blind or visually impaired” and “I am a sighted person”. When we have given our acceptance, we go to a screen where information is presented in real time, both for volunteers who are registered and those who are blind. We then press the button “I am a sighted person” and we fill in the registration fields. We are now ready to help anyone who needs it. We open the app after we have downloaded it on the phone. On the next screen, we select the button “I am a blind person” and we register using our Facebook account or our e-mail account. On the next screen, we select the language and allow the use of the phone camera and microphone. Now we’re ready. All we have to do is push the button “Call the first volunteer available” and wait for someone to take the call. 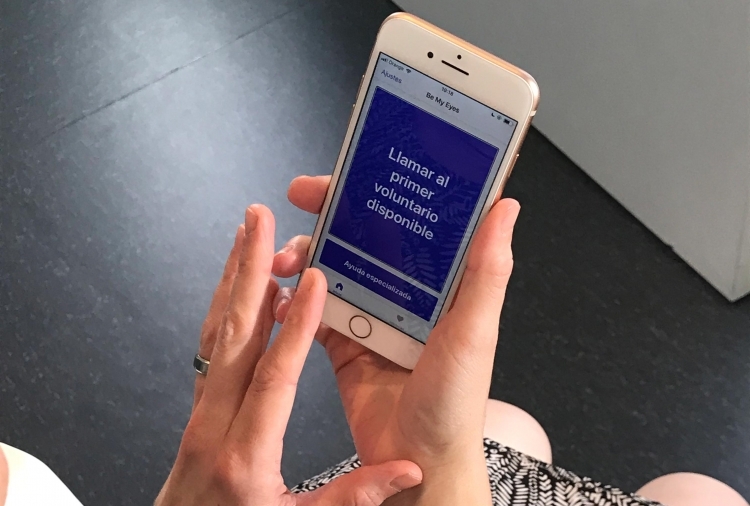 Be My Eyes is one of the apps selected by Silver, a project promoted by the Institut de la Màcula, Barcelona Macula Foundation and DRJ Consulting that aims to provide assistance and generate useful information for families with visual problems and their relatives.